Don't miss the new BAG opening Stand at Attention reception this Friday, June 26th at 6pm. Stand at Attention is a new collection of work by Irish artist Réamonn Byrne. 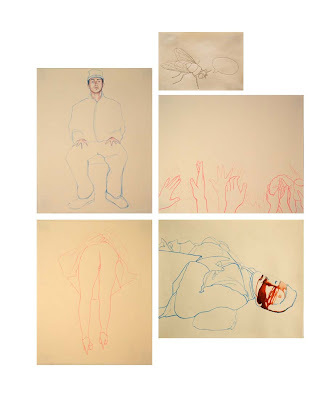 Formations of linear drawings in ink, pencil and paint on paper resemble groups of documents or blueprints in that they present distilled information, reduced to line and accents of paint. Each batch forms a cohesive visual whole, yet the eye lays focused on a single piece at a time, exploring the individual's minute responses as attention flutters amongst the frames. These simple structures pose questions about how narrative is constructed and how we process visual information. In this body of work the artist takes this format and turns it on himself. Members of the Irish Brigade of the American Civil War are depicted throughout the work, surely heroes in that pivotal time for their new nation. It is in this posse that the artist places himself introspectively against his peoples historic endeavors. Ambivalence becomes evident in this exploration of identity as the artist gnaws at both his own and the collective psyche. Memory and its ritualized forms also figure in the work as the artist plays with the notions of the eulogy and the memorial. The cathartic nature of such ceremony is echoed through the work as the self struggles to reconcile with its own ever changing perception of the greater whole. Réamonn Byrne lives and works in Brooklyn. He is a product of the Crawford College of Fine Art, Cork, Ireland.